Stitched Together: It's Wednesday..... I think! I gather, from all the WIP posts in my feed reader, that it must be Wednesday. I don't really keep track of days much at the moment, because I have an empty schedule. 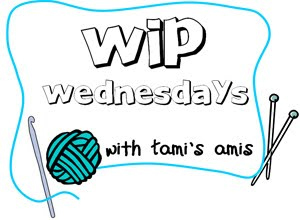 But I thought I would join in today, with WIP Wednesday, and test out my new "easy on the body" version of blogging. It has gone surprisingly well so far! I simply snapped some photos (they aren't great, but they are certainly not bad) and loaded them onto my lovely new laptop, tweaked them a bit and here we are! I have to say, getting a laptop was one of my better ideas. It is lovely to lay on the sofa downstairs - in the same room that I take the photos in - and work on the Internet. As I went into hospital last week I, of course, had to have surgery knitting. 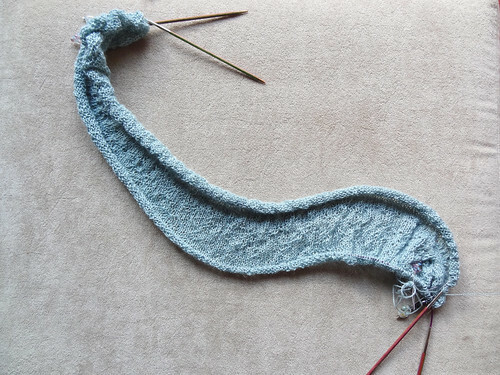 Surgery knitting has to be very straight forward, it has to take up only small amount of space and most importantly it has to start conversations! When you are in hospital you are surrounded by strangers, both staff and patients, and having something to keep you occupied AND encourage conversation is a winner on my list. So I scoured my favourites and my stash and came up with a combination I could live with. It wasn't until after I got home from hospital, that I found the reason the combination felt so right together was because I had seen the yarn and the project together before - in the same colourway too, on Crafts from the Cwtch! The pattern is Nuvem by Martina Behm, the same person who designed Hitchhiker, the scarf I made last year. It's a HUGE stocking stitch elongated hexagon with a ruffle around the edge. The pattern is perfect brainless knitting and you can see that I got started in hospital, where it did indeed mean that I had 3 nurses and another patient round my bed at one point. They were fascinated by knitting this on two long circular needles. I had to carefully explain how it worked and they loved the yarn as much as I do. The yarn is Garnstudio DROPS Lace, which is a lace weight, alpaca/silk blend. It's lovely and the sage green bares a very striking resemblance to another project I am working on. 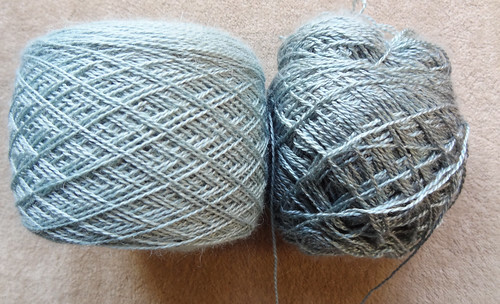 The yarn on the left is the Garnstudio yarn and the yarn on the right is Posh Yarn Audrey 2ply, which is a cashmere/silk blend. They look as if they were dyed in the same pot. The Posh Yarn has 60% silk content and the Garnstudio has only 30% silk content which is why I think it has a more matte finish. I am feeling pretty lucky about this close match because my Posh Yarn seems to be running out faster than I would like. I may have to subsidise the Posh Yarn project with the Garnstudio yarn as an edging. I won't share the pictures or project details here, because it is a gift. If you are a knitter who is interested, you can see it on Ravelry. This secret project has had most of my attention this week, but it hasn't stopped me casting on yet another project! This pattern is by Wendy Poush, and is part of the Twist Collective Winter 2011 Collection. These are convertible mitts, which are something I've wanted for ages. I had been looking for the right pattern for a while and these seem to fit the bill. They are quite long in the arm and the flap isn't loose and floppy when not fastened down. It also has the option to create a convertible thumb flap too. This means, out on my scooter I can have toasty warm hands and wrists and not have to remove the mitts when I get inside a shop. I am not sure my yarn choice is the best one for showing off the cables as it is a fuzzy alpaca based yarn. 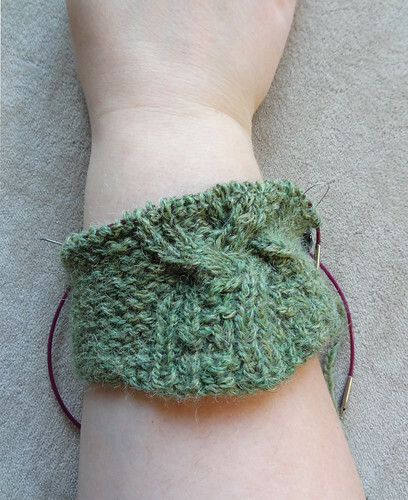 The yarn is Rowan Lima and it is so light and pretty, and also in this post's colour theme of sage green! The soft fuzzy chainette yarn hides the cable quite a lot. I did think about ripping this mitt back and using a different yarn that would make the reversible cable pop, but this yarn is too delicious for me to set aside. I really want to wear these mitts even if the cable is lost, because they will be warm and light and soft. Maybe after I've made and worn these for a while I will get the urge to knit the pattern again in a nice plump wool, but at the moment I just want these mitts to be done so I can wear them. To see other projects that aren't sage green, click on the button!